I own a Rodgers 3-manual 945 organ. When I purchased Hauptwerk I noticed that there were no free sample sets for organs larger than 2 manuals. I therefore used the CODM to piece one together from three excellent sample sets that are nearly-free to licensed Hauptwerk users: the St. Annes Moseley organ that comes bundled with Hauptwerk, and the Little Waldingfield and Groton organs from Lavender Audio. The Lavender Audio organs are shareware so they are available at a very low cost. In addition you may use them for a limited trial period for free evaluation. 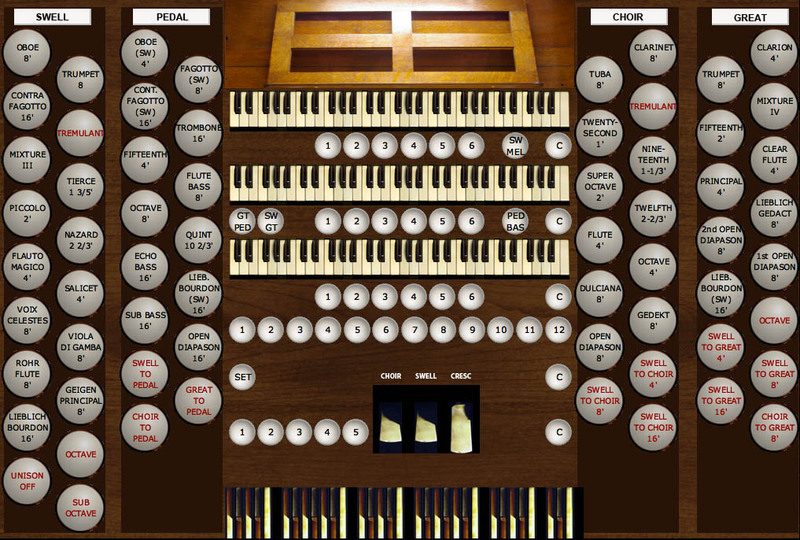 Important: Be sure you install the versions of the Lavender organs that are available from the Hauptwerk web site, at Download these at http://www.hauptwerk.com/downloads/instrument-downloads/. If you instead try use the versions that you can order direct from Lavender on a DVD, the Little Waldingfield organ will not be the correct version for use with my organ and you will get an error message when you try to load it. I used the St. Annes Moseley organ for the Pedals, Great, and Swell. 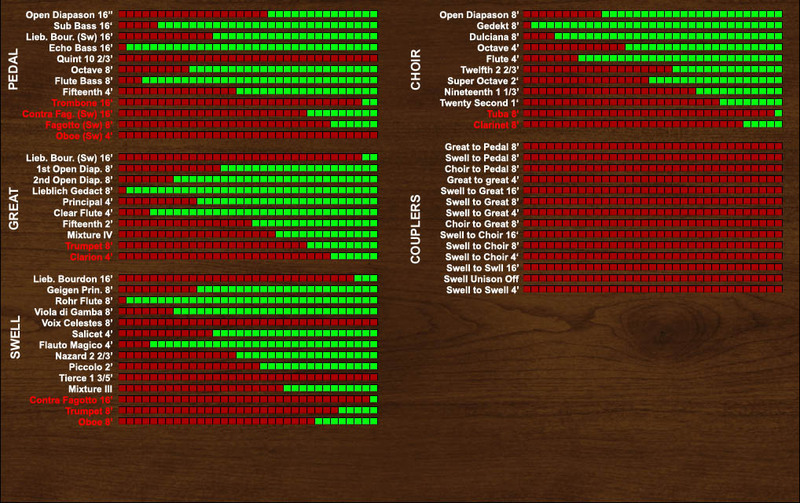 I took some of the stops and moved them to a new choir manual. I then used the Lavender Audio samples to fill out the choir. For version 2.1, I fixed a bug that caused the "Bass Coupler" to function improperly. In the new version, engaging the coupler correctly plays the pedal stops from the lowest note only of whatever is played on the Great. I also added some borrowed stops in the Pedal to give it more independence and reduce the need for coupling. 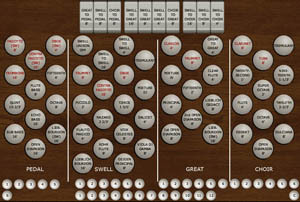 Version 3 of the Composite English Organ has been updated to take advantage of several new features in Hauptwerk 4. It will not run in Hauptwerk 3. 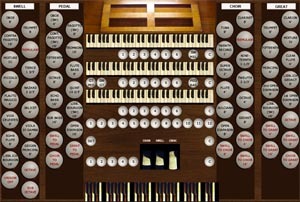 If you do not have Hauptwerk 4, you can still run Version 2.1 of the Composite English Organ. Most important, Version 3 takes full advantage of the resampled St. Annes that ships with HW4, including the increased resolution and the multiple release samples. Version 3 also sports a crescendo pedal, courtesy of Al Morse's software plus my own special software to massage Al's output into the graphical displays I have created. I have also completely rewritten the tremulants. I have also completely redesigned the "Console" display for Version 3. It now has the correct look and feel of a medium-sized English cathedral organ. The controls are correctly placed and colored for such an instrument. I left the "Stop" display in American STandard format so both schools of organists should feel comfortable. Finally, Version 3 includes some revoicing. The most profound change is the revoicing of the old Choir "cornopean" into a more useful "tuba." Here is a shot of the "console" and "stop" views. Click on them for full-size views. All my consoles are sized to fit on a 1024x768 touch screen monitor I keep atop my Rodgers. This one is optional. I provide the source code for the Hauptwerk editor so you can see how I did all this and get ideas for your own projects. You will have to rename this file after downloading to "Les-CompositeEnglish-3Man-V3.CustomOrgan_Hauptwerk_xml." I could not get the download function to work properly with the new extra-long file extension required by Hauptwerk 4! 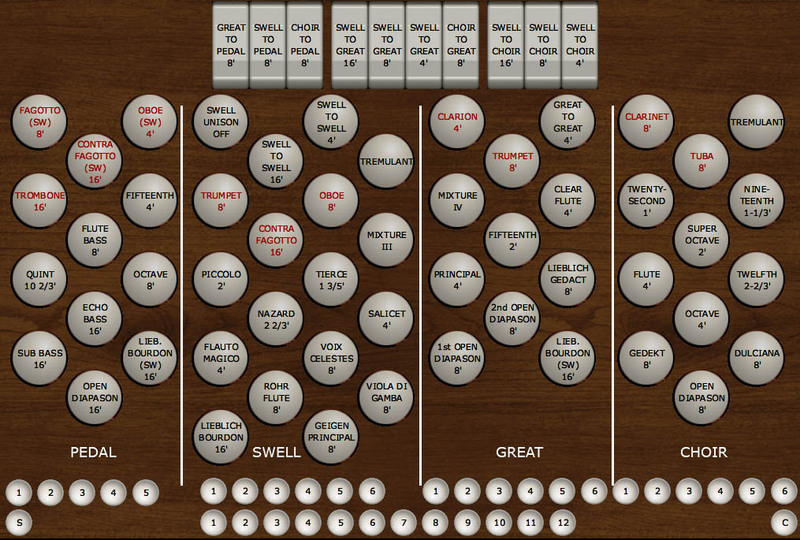 Of course, the CODM version of this organ does not include the crescendo pedal. This organ works so well because all three of the source organs are of similar style and were sampled in similar acoustics.